Chips and salsa is always good, right? When I was in college I practically lived on the stuff! But why don’t we try to take the salsa to a whole new level? Stop buying the canned stuff from your local grocery store and make this instead! This is an oldie but a goodie! I have been serving this salsa for about 10 years now, and I swear that everytime I make a batch everyone ooo’s and aaaa’s over it. It is just good… there’s no other way to explain it. Combine the dressing ingredients in a blender. Process till thoroughly blended. 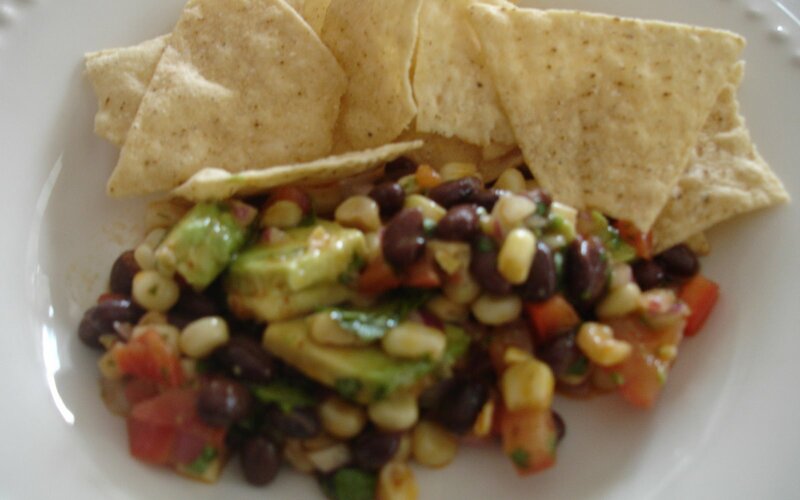 Combine the beans, corn, bell pepper and onion in a bowl and mix well. Add the dressing, starting with about half the dressing and toss to coat. Add more dressing if needed, to taste. Marinate, covered, at room temperature for at least 3 hours, stirring occasionally. Just before serving, stir in the tomato, avocado, and cilantro. Serve with tortilla chips. Note: fresh sweet corn may be used without cooking first. I have also used Trader Joe’s frozen super sweet white corn, and it works great. Oh, yum! I love black beans so I am sure I’ll love this salsa! I love black beans and I love salsa so I’ve got to give your recipe a try. yuM! This looks so good! I would love for you to come link this and/or any other projects you have been up to at the Tuesday Talent Show! Hope to see you there!